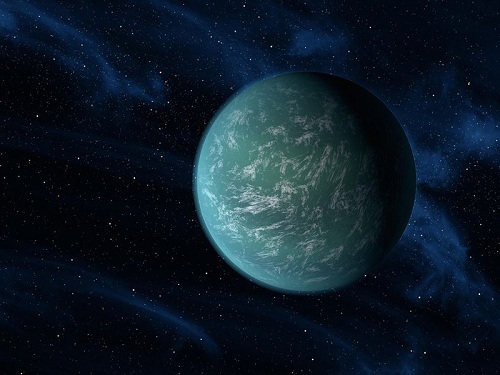 Image: An artist’s conception of Kepler-22b, once thought to be positioned in its star’s habitable zone. New work on habitable zones suggests the planet is actually too hot to be habitable. Credit: NASA/Ames/JPL-Caltech. Habitable zones are always easy enough to explain when you invoke the ‘Goldilocks’ principle, but every time I talk about these matters there’s always someone who wants to know how we can speak about places being ‘not too hot, not too cold, but just right.’ After all, we’re a sample of one, and why shouldn’t there be living creatures beneath icy ocean crusts or on worlds hotter than we could tolerate? I always point out that we have to work with what we know, that water and carbon-based life are what we’re likely to be able to detect, and that we need to fund the missions to find it. The last word on habitable zone models has for years been Kasting, Whitmire and Reynolds on “Habitable Zones around Main Sequence Stars.” Now Ravi Kopparapu (Penn State) has worked with Kasting and a team of researchers to tune-up the older model, giving us new boundaries based on more recent insights into how water and carbon dioxide absorb light. Both models work with well defined boundaries, the inner edge of the habitable zone being determined by a ‘moist greenhouse effect,’ where the stratosphere becomes saturated by water and hydrogen begins to escape into space. The outer boundary is defined by the ‘maximum greenhouse limit,’ where the greenhouse effect fails as CO2 begins to condense out of the atmosphere and the surface becomes too cold for liquid water. When worked out for our own Solar System in terms of astronomical units, the 1993 model showed the habitable zone parameters extending from 0.95 to 1.67 AU. Earth was thus near the inner edge. The new model improves the climate model and works out revised estimates for the habitable zones around not just Sun-like G-class stars but F, K and M stars as well. The definition uses atmospheric databases called HITRAN (high-resolution transmission molecular absorption) and HITEMP (high-temperature spectroscopic absorption parameters) that characterize planetary atmospheres in light of how both carbon dioxide and water are absorbed. The revision of these databases allows the authors to move the HZ boundaries further out from their stars than they were before. Read more: Habitable Zones: A Moving Target — Centauri Dreams.